Standing out, leaving a lasting impression, being memorable and creating a fun interactive experience could pretty much sum up what any brand strives for as they put themselves out there at festivals, concerts and any event that attracts a mass of people. 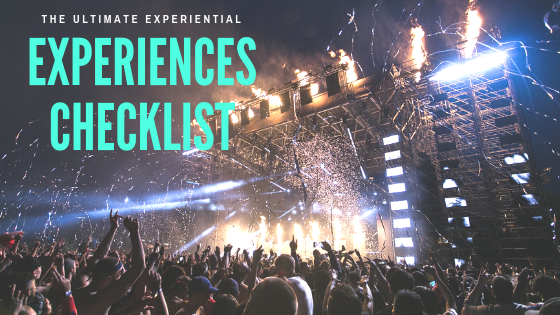 There is power in checklist and making sure you have every detail checked off will ultimately leave you winning with an amazing experiential experience. It’s important to remember that the best ideas without a solid execution will not enhance the goals you set forth. One of my favorite lines is from the sports drama, Field of Dreams, “If you build it, they will come.” A lot has changed since 1989, but the simple truth is building an experience that aligns with your brands goals and the passion of the attendees will create a movement of loving your brand and what you offer. Here are a few tips to ignite your experience/activation so they will come. Create a plan to generate excitement among attendees before they get to the event. This can be easily done using Social Media. Create a killer sizzle reel that gives followers and fans something to look forward to. Showcase the experience you are creating or provide some sort of incentive to get them there. Share it everywhere! If budget allows create an event pre-festival (link to the Citi-Global Citizen Festival paragraph of the Experiential Experiences Done Right Article). If not, pre-festival consider an out-of-festival (link to the Lollapalozza – Bed Head Hotel paragraph of the Experiential Experiences Done Right Article) event which will give you exposure to additional peeps beyond the festival/event grounds and promote your partnership with the event. A pre-festival event can also be used to offer an exclusive V.I.P. experience for your V.I.P. customers. If attendees can take one quick glance at your activation and notice who you are is a huge win. From the get-go make sure your brand style guide, tone and messaging are incorporated consistently on all mediums. From social post to what your ambassadors are wearing should look and feel the same. A helpful tip is to create a storyboard or Pinterest page with all pieces of communication, signage, apparel, activation elements, giveaways and so on. If something looks out of place, then fix it or nix it. Consistency eliminates confusion and helps convey your message and tone seamlessly. The employees are the heart of your organization. They provide that human connection. They personify your brand’s culture. If your employees are willing to volunteer let them. Heck encourage them too! Nobody represents the brand better than the people that keep the company humming day-in and day-out. Brand Ambassadors are also a viable option. An important point to remember is that who is representing the brand should be knowledgeable and passionate of the service and/or product offerings. Friendliness, smiles and hospitality are key. Make sure they look the part, give them the tools to provide an engaging experience and let them have fun with the attendees. If you have the means power forward with an engagement strategy that is an out-of-the-box, one-of-a-kind activation (link to the SXSW – Los Pollos Hermanos paragraph of the Experiential Experiences Done Right Article.) The competition between brands is real and to stand out you will have to up the ante. Make sure the activation allows the attendees to interact with the brand and provide a personalized experience. There will be times that the activation does not include or feature the product or service and that’s OK. If the activation exudes a wonderfully positive brand association and offers an unforgettable experience, then go for it! The benefit of a crazier and more interactive experience is insane social media impressions and earned media coverage. This is your chance to hand out a promotional product that brings your brand home. Your giveaway should be on point with brand, relevant and useful. Make sure you stock up! The last thing you want to happen is for a festival goer to rush over for that super cool portable fan that blows mist in your face and you run out and it is 100 degrees and they leave disappointed and overheated. Major fail…no matter what, make sure you have enough. Gamify (link to the Jet Blue – The Ultimate Icebreaker paragraph of the Experiential Experiences Done Right Article.) the experience to earn that premium item. An interactive game creates a bit more time between the attendee and brand. Keep it short and high energy. A unique event hashtag can help track conversation. Don’t forget social sharing buttons. Host an Influencer and tie them into the content. Their massive following and shareability can be a huge social booster for the brand. Main Takeaway is throughout the entire planning process always think about the potential consumer and how best to engage them with you have a chance. Build a truly remarkable and engaging experience and they will come. Experiential events could possibly be the best place for brand and consumers to bond and dreams come true.